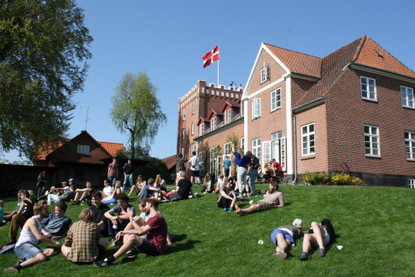 Ry Højskole is a Danish folk high school in the tradition of independent schools offering non-formal education for adults – we call it education for life. Danish folk high schools offers no exams and makes no demands for previous grades or occupation. These schools belong to a unique concept in Scandinavian cultural tradition and they are recognized and subsidized by the Danish Ministry of Culture. The folk high schools aim at expanding knowledge and awareness through working with body as well as intellect, with musicality and creativity as well as reflection. Unfolding the student’s commitment, sense of humor and personal courage, the folk high school experience builds awareness of ideals and values and of, what it takes to be a democratically minded member of society. Teaching at folk high schools is dialogic and is done in co-operation and on an equal footing between teachers and students. Attending classes is mandatory. In general the teaching at Ry Højskole takes place in Danish but teachers and students will help translating instructions and information into English. Thus to be a student at Ry Højskole you need to be able to communicate well in English. 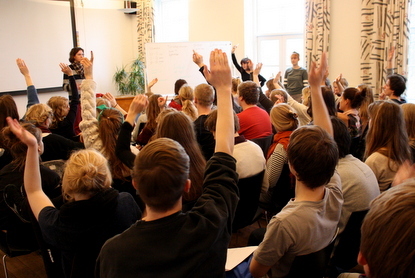 International students will follow courses in Danish for foreigners. The main subjects at Ry Højskole are Theatre, Music, Art & Design, Outdoor life, and Journalism. Read about courses to attend.